Contact mode AFM is mainly used to image hard surfaces when the presence of lateral forces is not expected to modify the morphological features. In the first AFM applications, the contact mode studies were aimed on getting high-resolution results and, particularly, achieving molecular and atomic resolution on crystalline surfaces such as mica, Au (111), salt crystals, chalcogenides of transition metals, polymer crystals, organic layers, etc. Height, deflection (error signal) and lateral force images of these compounds showed molecular and atomic-scale periodical patterns corresponding to the crystallographic lattices of the samples. The first commercial AFM probes were made of Si3N4 and have triangular cantilevers with pyramidal tips and opening apex angle of 60 - 70 degrees. These probes do not always have a fine enough apex and different sharpening procedures were tried to improve this feature. At present, Si probes are more common for AFM applications and soft Si probes with stiffness ~ 0.1 N/m and apex of 7 - 15 nm are most suitable for the contact mode studies, including high-resolution imaging. Fig. 1. CdF2 films grown on a CaF2 (111) substrate. Scan is taken in contact mode using a CSC21 probe (now upgraded to HQ:XSC11). Scan size 2 x 2 µm, height 2 nm. Image courtesy of Prof. Gastev, S-Petersburg. 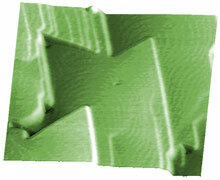 The tip-sample forces and their control are the most important issues of AFM. This has been recognized from the very first contact mode applications. The experience of using this mode showed that soft materials can be easy damaged because of the large normal force and/or shearing deformation. And when a sample is rigid, imaging in contact mode may destroy a sharp tip apex. Typically, the forces applied to samples in the contact mode are in the range from tens to hundreds of nanoNewtons. Additionally, most surfaces in air are covered by a layer of adsorbed water and other contaminants, whose surface tension pulls the tip and probe downwards. Electrostatic charges on the tip and sample can also give rise to additional long-range forces and complicate the imaging. It is difficult to judge in advance if contact mode imaging can be applied for characterization of a particular sample. For this purpose, measurements of the tip-sample normal forces are performed with force curves (deflection-versus-distance relations). The examination of force curves with probes of different stiffness can be useful for defining the operation parameters and most appropriate probes for imaging. The force curves help recognizing capillary forces and adhesion, determining regions of attractive and repulsive tip-sample forces, a range of forces (deflections) for tip-sample elastic deformation as well as a tip-induced sample deformation and type of the latter (elastic, inelastic, etc). Besides force curves, there are various practical procedures to ensure stable and controlled-force imaging. After tip engagement an operator might try lower set-point deflections to minimize the tip-force, increase the feedback gains and optimize scanning rate to make imaging stable. This is achieved when height contours in the trace and retrace directions match each other and topographic or height images are practically identical in consecutive scans. Actually, the observed topography is not necessarily that of the top most sample layer. It might happen that what is in the image represents the morphology of a more rigid sub-layer while the top layer is removed by the tip. This guess can be checked by performing a larger scan at the same tip-force and imaging conditions. During scanning, an effective tip-force and possible sample damage is also related to the time the tip spent in the sample location. Therefore, a tip-damaged area is often seen as a "window" in the larger scan. If such effect is found a lower tip-force or a softer probe should be tried for imaging of the topmost layer. If a sample allows imaging at different tip-sample forces, this circumstance could be used for a compositional imaging in contact mode. Surface locations with different stiffness can be depressed by the tip-force to dissimilar levels and, therefore, their contrast in height or topography images will depend on imaging force. At present, oscillatory modes are used much more frequently than contact mode, because the former can be applied to a broader range of materials. However, in some applications contact mode imaging is still attractive due to the higher imaging speed compared to the oscillatory modes. Comparative studies of some samples with both contact and oscillatory modes could be beneficial for interpretation of their images and sample characterization. When scanning in fluids (for example under water or physiological buffers), the capillary force is eliminated and the electrostatic forces are largely screened. Consequently, in experiments under liquids imaging at lower forces is easier achieved than at ambient conditions. Important: The aluminum reflective coating is stable in water and ethanol. However, certain experimental conditions that may cause its corrosion. For example, Al dissolves readily in caustic alkali solutions to give aluminum hydroxide. When Al coating is subject to corrosion, use uncoated cantilevers or cantilevers with chemically inert Au coating.